Please join us for a time of fellowship and singing for our first ever Hymn Sing. 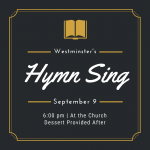 It will be Sunday evening, September 9 at 6:00pm at Westminster Presbyterian Church. Following the Hymn Sing, we will have dessert. 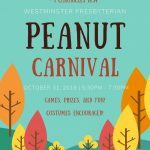 We hope you join us! A New Members Class will be offered starting Wednesday, August 15th at 6:15 PM. This is a four week class for anyone who has recently joined or is interested in joining the Westminster family. Wednesday Night Programs to Resume August 15th! Mark your calendars, our Wednesday Night programs will return on August 15th! Dinner will begin at 5:30pm. Immediately following morning worship services on Sunday, July 29th, there will be a fellowship meal in the gym. All members and visitors are welcome to come and enjoy great food and fellowship.